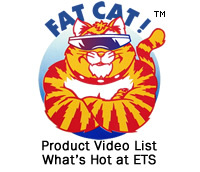 Q: What does ETS do? A: We design, build & market some of the best baluns available today. Q: What is a balun? A: It's a transformer that allows you to connect two different kinds of wire and maintain signal integrity. Q: Why the name, balun? A: It's a conjecture of two words balanced & unbalanced. Q: Do baluns need power? A: Baluns come in both active & passive versions, the passive version does not need power. Q: What is a real world use for baluns? A: They are used extensively in the audio & video arena to replace coax cable with UTP CAT5 & 6 cable. Q: Who typically needs baluns? Q: Why buy ETS baluns? A: Our customers save a lot of money by using the quality designed and built ETS baluns with UTP or existing cable without losing signal quality.